HOUSTON — (April 12, 2018) — Houston Mayor Sylvester Turner and Rice University today announced plans for a new Midtown innovation district that will transform a 9.4-acre site, anchored by the former Sears building, into a hub designed to bring together the area’s entrepreneurial, corporate and academic communities into collaborative spaces and programs. The district will combine a variety of commercial uses with housing, food and entertainment, iconic public space and best-in-class infrastructure, Leebron said. “The surrounding neighborhoods’ vibrant and rich culture will be embraced to create an eclectic, engaging streetscape that blends the historic with the new and celebrates Houston’s diversity,” he said. “This will be an innovation and incubation facility for all Houston. Rice owns the property, but the enterprise will be a collaborative mix of many different participants and activities,” Leebron said. Leaders of many of the major educational institutions in the region, as well as corporate leaders in the health care, energy, industrial and technology industries, have indicated their desire to participate in this centrally located innovation district. The site, owned by Rice Management Co. as part of the university’s endowment, is located in close proximity to the METRORail Red Line and central to downtown, the Museum District and the Texas Medical Center (TMC), which has committed to support the project, along with the Greater Houston Partnership (GHP) and Houston Exponential (HX). The site is at the epicenter of Houston institutions of higher education, with nearly all located within a 3-mile radius, Leebron said. He said the University of Houston, the University of Houston-Downtown, Texas Southern University, the University of St. Thomas, Houston Baptist University, South Texas College of Law Houston, Houston Community College and Lone Star College have expressed their support for the project and intention to participate. The TMC plans to put its digital initiative in the facility when it is completed. 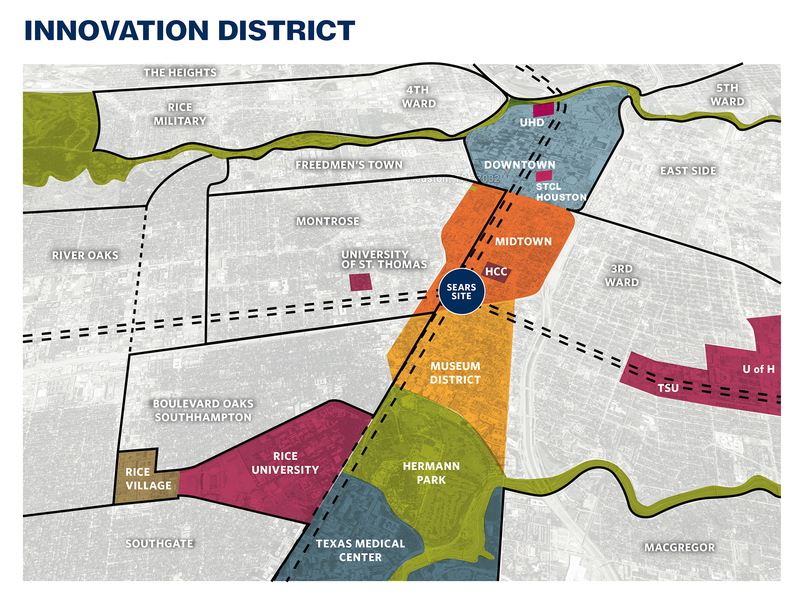 In developing these plans, Rice worked closely with the GHP, HX and Station Houston, the region’s hub for tech innovation and entrepreneurship focused on digital technologies. Station Houston will serve as incubator and amenity program operator and will work on three key initiatives: connecting ecosystem players to drive high-impact collaborations; supporting entrepreneurs and the innovation community through a range of programs, workshops and events; and working with academic institutions and other groups to develop and connect Houston’s digital workforce. The former Sears building will be renovated for the project. The overall design and development of the building will be led by Hines in conjunction with architects Gensler and James Carpenter. The initial phase is expected to be completed within two years. The redevelopment of the building will respect its historic character while making the modifications required to create dynamic space for creative companies in the innovation ecosystem, Leebron said. “The many participants already committed to this vision typify Houston’s collective spirit of inclusivity and entrepreneurship, and we welcome people and organizations who can contribute to its overarching mission,” he said. Tags: Administration, Entrepreneurship, Houston, President, Rice Management Co.